Traditional Thai houses from the different regions in Thailand have their distinct characteristics and designs based on the region's history and culture. At a cursory glance, they may all appear to look alike but there are subtle differences between these old Thai houses from the central, south, north-east and north. Previously a visitor will have to travel to the four corners of Thailand to view these houses. Today, there's a model settlement with life-sized replicas of these old Thai houses right in the heart of Bangkok. Siam Niramit in Ratchadaphisek, a theater giving spectacular Thai cultural displays has just such a place. The permanent display area is within the theater grounds. Guests to the cultural show can go earlier to visit these houses. 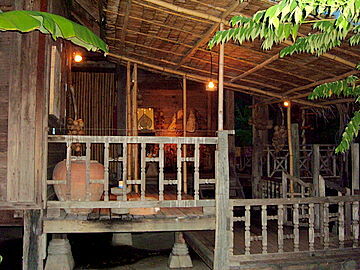 The tour of these old Thai houses is included in the ticket to the cultural show. There's even a canal around the housing complex for guests to take a boat tour of the model settlement which comes with an actual padi field and orchard. If you don't fancy a boat ride, you can take a walk along the raised gravel path to see the various houses. Let's take a pictorial tour of these traditional houses. 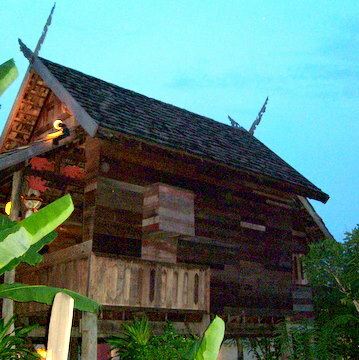 There're three actual examples of traditional Thai houses from the central region in Bangkok. They are the M R Kukrit Pramoj Heritage Home and the Jim Thompson House. 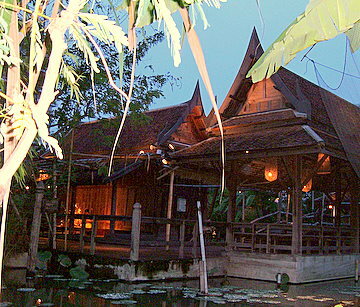 The houses in Suan Pakkad are also in the central Thai design. It's hard to imagine that this area is right in Ratchadaphisek Road with all its condominiums, supermarkets and office blocks. 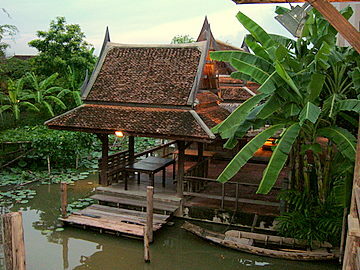 Traditional Thai houses from the south are characterized by the ornate stair and the verandah railings. 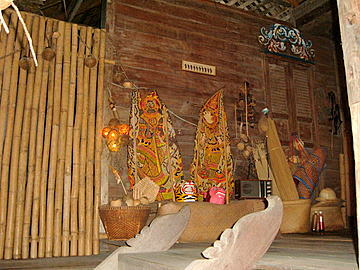 The puppets are called "nang talung", the traditional shadow drama. The figures are cut out from buffalo hide and moved behind a lit screen accompanied by music and a narrator. It's similar to the "wayang kulit" or shadow puppet show in northern Malaysia. 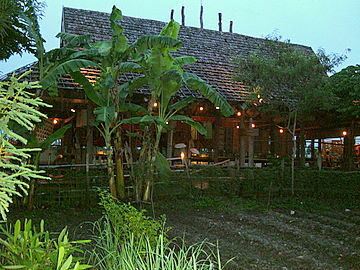 The scaled down padi field and orchard are next to the house from the north-eastern region or Isarn. 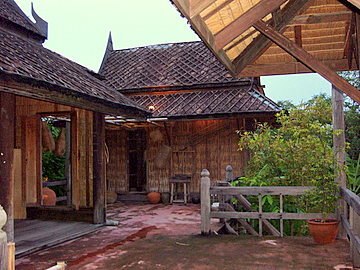 Traditional houses from the north or Lanna houses have a distinct feature. This is the "V" shaped wooden structure called "Kalae" atop the gable. 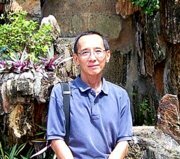 For an actual Lanna house in Bangkok, please visit Kamthieng House in Asoke. Traditional Thai houses are a fast disappearing feature in Bangkok. It’s hard to find any except for heritage homes and museums preserved for posterity. Even in the provinces, their popularity is fading in favor of modern concrete houses. These old Thai houses are indeed precious legacies to be preserved. 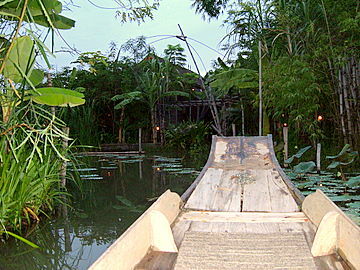 For more traditional Thai houses, please see Floating markets of the four regions, Pattaya. To return to Bangkok photographs.